You are on the right track, my Butterfly. Even if your social anxiety is at a peak and you are having the worst day of your life. Even if you feel that all your decisions and actions in the path have been nothing but a series of utter failures that has left you feeling washed up and drained on a deserted island in the middle of a swirling, desolate, cruel ocean. Know that you are on the right track, and know that you have another chance, because: You are alive. Broken, maybe. Lost, maybe. Despairing, maybe. But you have a twinkling spark within you, which, when nurtured correctly, will burst forth into an effervescent flame. All you need to do is look around and glimpse the little bits of light that manage to shine into your life. Find the light, and follow it. The light will lead you to the place that you need to be. And if you can’t see any light in your life? Take a guess. Take a chance. Find which path might be your best option, and take your first step onto it. Sure – the path you choose may look scary. It may look littered with obstacles and tree roots that aim to trip you with every step you take. But the simple act of being brave enough to choose a path (not the perfect path, for that doesn’t actually exist, but the path that looks the like most interesting and is light enough for you to make out the general course you need to tread) and then actually setting out on that path, is the bravest decision you will make, and will absolutely bring you closer to your goal of beating social anxiety. Perfection is not the aim. Humans live on planet Earth, and have agreed to live by earthly principles, in an animal body. One of these principles is that ACTION causes REACTION. That basically means that you DO something, and then SOMETHING does in return. And there is always a space. A space between action and reaction. A space between your decision to do something, and then the actual action on it. And then a space between your action, and the result of that action. This space may appear to you to be only an instant, or it may take hours, days, weeks. Remember: Time is an earthly perception. It’s useful because it’s a measure of how you spend your energy. The space that exists between action and reaction (reaction being results – improvement on your social anxiety) is purely the reflection of how distant your current vibration is to the vibration of what you DO want. So it might take a few goes. A few false starts. A few trial and errors. Perhaps you will set off on a path that looks wonderful and light-filled at first but when you turn that first corner, the light dips away. What matters is: you don’t stop seeking what you want. You work up the guts to turn around and track back and get into a new path. Massive decisions, hard decisions, decisions that involve work and effort and growth are made every single day. Because, one by one, humans are realising that there is more opportunity for you in this lifetime. If you are unhappy where you are, and how your life is progressing, you CAN make the choice to change it. To shift it. To make a new story for yourself. 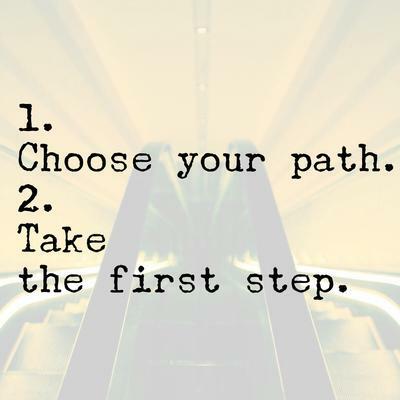 Just choose your path, and take that first step.